eaw016051 ENGLAND (1948). Radlett Aerodrome, Frogmore, 1948. This image has been produced from a print. 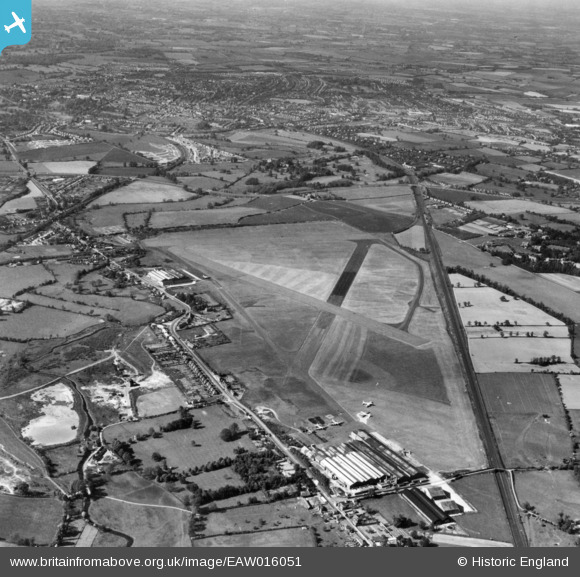 Title [EAW016051] Radlett Aerodrome, Frogmore, 1948. This image has been produced from a print. The former A5, Watling Street, now the A5183. London Road station on the Great Northern, later LNER, branch line from Hatfield to St Albans, where it joined with the LNWR branch line; opened in 1865. The branch from Hatfield closed to passengers in September 1951, and completely to goods in 1968. By 1986 the line had been converted to a footpath and cycleway called 'The Alban Way'. LNWR branch line from Watford Junction to St Albans Abbey station - still in use, although a suggestion has been made that it should be turned into a 'busway'. Remaining traces of the line linking the LNWR Watford-St Albans Abbey branch to bring in materials for the construction of the Midland Railway line in the 1860s. Closed shortly after the MR line was completed, and never used for passenger trains. Remaining traces of the line linking to the LNWR Watford-St Albans Abbey branch to bring in materials for the construction of the Midland Railway line in the 1860s. Closed shortly after the MR line was completed, and never used for passenger trains. Railway line curving away to reach St Albans City station - the Midland Railway was originally planning to go in a straighter line further from the St Albans city centre, but was persuaded by the 'city Fathers' to divert to a position closer to the city centre than the MR's original plans. Siding serving the Hospital, the northernmost buildings of which can be seen. Napsbury Signal box - remained in use until December 1979, and demolished soon after. The next box down the line, St Albans South, has been preserved and is regularly open to the public - see www.sigbox.co.uk. North Orbital Road, previously the A405, now the A414. Napsbury Station, opened 1905 to serve the nearby Middlesex Mental Hospital; the station was closed in 1959 when local services were taken over by DMUs from steam-hauled services. There was only an island platform serving the slow lines. Midland "London Extension" railway, built 1868. This airfield is the centre of a controversial planning decision, by central government, to allow the construction of a 'Railfreight Terminal' connected to the Midland Main line, but without a connection to the nearby M25.